KB Support Tape is designed to be applied any time you want extra support and protection for your injury. It can be applied between treatments with the BFST® and ColdCure® Wraps. The Tape provides ongoing compression throughout the day, so you get swelling relief that's light, comfortable and doesn't restrict movement. KB Support Tape also helps to prevent re-injury by providing damaged tissue with targeted support and protection. Why is this important? Because when you're not doing treatments, fragile, healing tissue is at risk of further damage as you go about your daily activities. KB Support Tape is ideal for use on a range of conditions, including Tennis Elbow, Plantar Fasciitis, Rotator Cuff Injuries, Knee Strains, Achilles Tendonitis, and many more. Avoid re-injury and speed up your healing time by using KB Support Tape - it's armor for your injury. How does it work? When you apply KB Support Tape, it works with your skin to keep the underlying tissue in place, preventing re-injury. Comfortable to wear, and still relatively stretchy, your skin will be more rigid and less elastic than without KB Support Tape. By limiting the movement of your skin, this also reduces the movement of the soft tissue underneath, further preventing re-injury and giving it support. Avoiding re-injury and giving support both contribute to a much faster healing time. KB Support Tape is made of thin, stretchy, breathable material. It's so lightweight and comfortable that you hardly even notice when it's on. It keeps you moving and active all day long because it's not bulky or heavy. You can wear it during all of your daily activities and it won't get in the way. Wear KB Support Tape while you're exercising, at work, driving, running errands, travelling, doing chores, etc. A single application of KB Support Tape lasts all day long. Apply it before daily activities or any time you're not doing BFST® or ColdCure® treatments. KB Support Tape is easy to apply and remove. Make sure your skin is clean, dry and oil-free prior to application. Read the instructions included with your KB Support Tape to find out how to apply the tape to your specific injury or condition or click this link: KB Support Tape Instructions. When you're applying the KB Support Tape, tear the backing off piece by piece as you go. This makes it much easier to apply properly and prevents the Tape from sticking to itself. What sets KB Support Tape apart from other tape products? It's medical tape, not athletic tape. This means our Tape is manufactured to ISO 10993 standards, which ensures that our Tape is made from extremely safe, biocompatible materials. Our Tape is actually made from safer materials than most baby products, including toys, clothing and even diapers. Don't let the big brand tapes fool you. Most of them are made from toxic materials, because there are no standards for athletic tape like there are for medical tape. Some big brand tape glues even contain carcinogenic ingredients. At King Brand®, your health and safety are of utmost importance, which is why KB Support Tape is manufactured to such high standards. 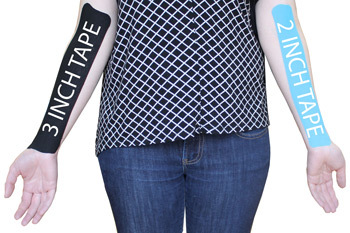 KB Support Tape comes in 2 sizes: 2 inch wide and 3 inch wide. The 2 inch wide variety is ideal for smaller areas (Foot, Wrist), while the 3 inch wide style is better for larger areas (Shoulder, Leg). This also works for your size. Bigger people will prefer the 3 inch wide Tape, while smaller people will prefer the 2 inch wide Tape. 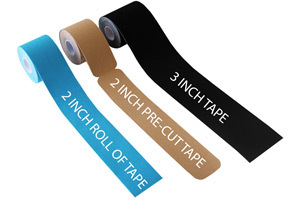 The 2 inch wide Tape comes in 4 different colors: Pink, Blue, Black and Beige. The 3 inch wide Tape is available in Black and Beige. There is no functional difference between the colors, they just allow you to express your individual style. All 4 colors are available in both Pre-Cut Strips and Continuous Rolls for our 2 inch wide variety. The Pre-Cut Strips of KB Support Tape have already been cut into strips for you, just apply it and go! They are fast, easy and convenient for anyone to use. Simply peel off the backing and apply. Each box contains a roll of 20 Pre-Cut KB Support Tape Strips that are 2 inches wide and 10 inches long. This is enough tape for about 7-10 applications, depending on how many strips you're using for each application. If you don't need to customize the application of your Tape very much or at all for your injury, the Pre-Cut Strips are for you. The Continuous Rolls of KB Support Tape are perfect for people who want more options in terms of cutting their tape into various lengths and shapes. The Continuous Roll is ideal if you want to cut your tape into extra-long strips or you have a unique shape you want to use in your application. The backing of the Tape has a handy graph design that helps you cut it along the length or width. Each box contains 1 Continuous Roll of KB Support Tape that is 2 inches wide and 16 feet long. This is enough tape for about 7-10 applications if you're measuring and cutting 10 inch strips, but will differ depending on how you choose to customize the size and shape of your Tape. 3 Inch Wide Tape On Left vs.
Our 3 inch wide KB Support Tape is designed for use on larger areas of the body, such as the Hamstrings, Quads, Shoulders, Back and more. 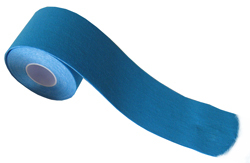 This wider tape provides even more support and protection than our regular 2 inch variety. This means maximum coverage of the injured area. It also means superior relief of your swelling. It does an amazing job of preventing re-injury during physical activity, or any time you're not doing treatments with your BFST® or ColdCure® Wrap. Can I Wear My Tape During BFST® & ColdCure® Treatments? There's no need to remove the KB Support Tape when you're doing ColdCure® treatments, as the cold will easily penetrate through the Tape. You can wear KB Support Tape during BFST® treatments, however, please be aware that a small amount of effectiveness will be lost in the area that the Support Tape is applied. This is because the Support Tape will act like a barrier between your skin and the Energy Web® within the wrap when you have them applied at the same time. If you want to accelerate the healing of your soft tissue injury and receive maximum pain and swelling relief, check out King Brand® BFST® and ColdCure® Wraps. These are FDA Registered medical devices that are designed to prevent, treat and cure soft tissue injuries. Call us toll free at 1-844-400-2525. Our Advisors will help you pick the right product and can answer any questions you may have. We're here to help you every step of the way. Note from KB WebMaster - The text below is primarily intended to assist with Google properly classifying this page content. To learn more about our products please visit our website.<br>Other names for KB Support Tape are sports tape, athletic tape and kinesiology tape. KB Support Tape can be used on injuries such as plantar fasciitis, rotator cuff, tennis elbow, knee injuries, achilles tendonitis, and many more. 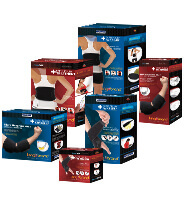 KB Support Tape is designed to provide your injury with support and protection between BFST and ColdCure treatments. Wearing KB Support Tape is like having a hard shell to protect your injured tissue from re-injury. 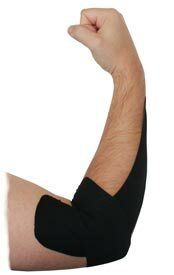 KB Support Tape is thin, stretchy and breathable. You can wear KB Support Tape during any of your daily activities. Wear KB Support Tape at work, during exercise, at home, etc. KB Support Tape comes in pre-cut strips and continuous rolls. KB Support Tape comes in 4 different colors: blue, pink, black and beige. KB Support Tape lasts all day. KB Support Tape is armor for your injury.